A joint connects two or more bones together. Most joints in the body are mobile, allowing the bones to move in relationship to each other. The vast majority of moveable joints are held together by an outer layer of tough fibrous tissue called the "joint capsule". The thin inner lining of the joint capsule, called the synovial membrane, produces joint fluid to lubricate the joint. 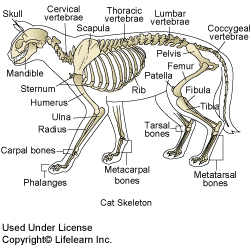 The ends of the bones are covered by a smooth layer of cartilage, called "articular cartilage". 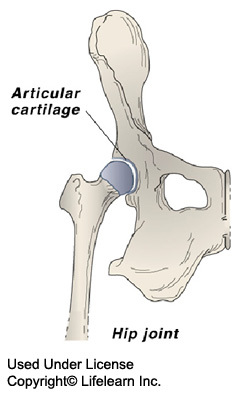 The joint fluid and the articular cartilage reduce friction within the joint, allowing it to move smoothly. The articular cartilage does not contain any blood vessels to supply it with nourishment or oxygen. Instead it receives some of its nutrients from small vessels in the bone that lies beneath it and the rest by absorbing nutrients from the joint fluid. What is the difference between arthritis and degenerative joint disease? The word arthritis comes from the Greek word "arthro", meaning "joint" and the term "itis", meaning inflammation. Thus arthritis is a general description for any condition that causes inflammation in the joints. As cats age, the tissues lining the joints deteriorate and degenerate. Degenerative Joint Disease (DJD) refers to arthritis or osteoarthritis which is the result of the gradual, irreversible deterioration of the articular cartilage within one or more of the joints. The formerly smooth and resilient cartilage becomes brittle as it degenerates. With severe DJD, the degenerated cartilage may actually break away from the bone and become loose within the joint. If the cat has had a traumatic injury to a joint, develops a joint infection due to a cat fight, or requires joint surgery, DJD will usually develop in the affected joint. Although DJD is not usually an inflammatory disease, mild inflammation plays a part in causing clinical signs. When the cartilage cells become damaged, they release substances that result in inflammation, causing pain to the cat and further damage to the cartilage of the joint, setting up a vicious cycle. As the degeneration continues, the joint becomes more unstable; scar tissue and/or bony growths will form within the joint in an attempt to stabilize it, contributing further to the DJD. What are the symptoms of DJD? "Although the main symptom of DJD in dogs is lameness, this is not the case in cats." Although the main symptom of DJD in dogs is lameness, this is not the case in cats. Since most cats with DJD show only subtle symptoms, DJD is often overlooked. Only recently are we beginning to realize that cats suffer from this debilitating condition. The most common symptoms seen in cats with DJD are reluctance or inability to jump up or down from the furniture, general reluctance to move (often perceived as 'sleeping more'), increased irritability when touched or handled, especially around the affected joints, stiffness, reluctance to sharpen the claws, reluctance to groom, and/or difficulty in getting into or out of the litterbox. Not every symptom is observed in every cat with DJD. Is DJD common in cats? DJD is an under-recognized disease in cats. Recent studies suggest that it is a very common condition in cats of all ages, although the likelihood of a cat developing DJD increases with age. The most frequently affected joints are the hip, the knee, the tarsus ("ankle" of the hind leg) and the elbow. Most of the damage caused by DJD is irreversible. The goals of treatment are to improve the quality of life by minimizing pain and discomfort and to delay the progression of disease. The quality of life for a cat with DJD can be improved by modifying the environment so that the cat can get around more readily and by providing pain relief. "Regular periods of gentle play using toys such as feathers or laser pointers may be helpful." Some suggestions for modifying the environment include providing a 'step' so that the cat can get up onto a favorite perching spot or sleeping area, providing litter boxes with shallower sides, placing litter boxes on every floor of a multi-level home, and making sure that food and water dishes are accessible. The cat should be encouraged to move about in order to maintain joint mobility and muscle tone. Regular periods of gentle play using toys such as feathers or laser pointers may be helpful. Pain relief in cats can be somewhat problematic due to differences in their metabolism of drugs. Cats are highly sensitive to side effects from acetylsalicylic acid, while even a single acetaminophen tablet can be fatal to an adult cat. ALWAYS get your veterinarian's advice prior to giving your cat any medication, and NEVER give your cat any pain reliever meant for human use. Prior to administering any pain medication to a cat, your veterinarian will recommend blood tests to ensure that the pet's liver and kidneys are functioning adequately and that there are no other underlying problems that could be worsened by the use of these drugs. Your veterinarian will also recommend periodic monitoring of your pet's liver and kidney function once treatment for this condition has been started. Ongoing research into the management of DJD in cats has led to the recent release of specific therapeutic diets that are formulated specifically to control the discomfort associated with DJD and to delay the progression of the disease. These therapeutic diets are available only through your veterinarian. What about other diet supplements? Omega-3 fatty acids have long been proven to help humans suffering from osteoarthritis and DJD. More information about Omega-3 fatty acids can be found in our handout "Fatty Acid Supplements". Their usage in veterinary medicine is growing in popularity and they are a useful treatment in conjunction with other medications for any patient experiencing DJD or osteoarthritis. Nutraceuticals are nutritional supplements rather than drugs, and two of the most commonly used supplements are glucosamine and chondroitin (for more information, see our handouts on these supplements). Some small research studies and numerous anecdotal case histories suggest these products are beneficial, and they appear to be free of side effects. Products formulated for use in pets that contain glucosamine and/or chondroitin, along with other trace elements and vitamins, have become commercially available in recent years. Some of these products are available over the counter without a prescription. Since supplements are not highly regulated at this time, some supplements may not contain the labeled amount of ingredients and differences in quality may exist between products made by different manufacturers. Your veterinarian may have preferred brands of these supplements that he or she will recommend. If you have any questions or concerns regarding the care and treatment of your cat, please do not hesitate to contact your veterinarian.